Do governments have an Internet kill switch? Last week, Syria experienced an Internet blackout which the government blamed on terrorists, but it is suspected that it was planned. During the Arab Spring of 2011, the citizens of Egypt were cut off from the Internet, leaving only a handful of web connections up and running. Complete shutdowns are not unprecedented; the Myanmar (Burmese) government shut down Internet connectivity in 2007, and the King of Nepal severed all international Internet connections in 2005. Chinese authorities also regularly cut off access on a local level. How can this happen? Do governments have a “kill switch” to turn off the Internet? Does something physical have to happen, like cutting actual cables? Or could the servers in charge of routing traffic simply be programmed to stop transmitting data? After the Syrian blackout, networking firm Renesys analyzed the connections between a country’s domestic Internet and the outside world. They found that some are highly regulated with only one or two companies holding official licenses to carry voice and Internet traffic to and from the outside world. “Under those circumstances, it's almost trivial for a government to issue an order that would take down the Internet,” states the company blog. 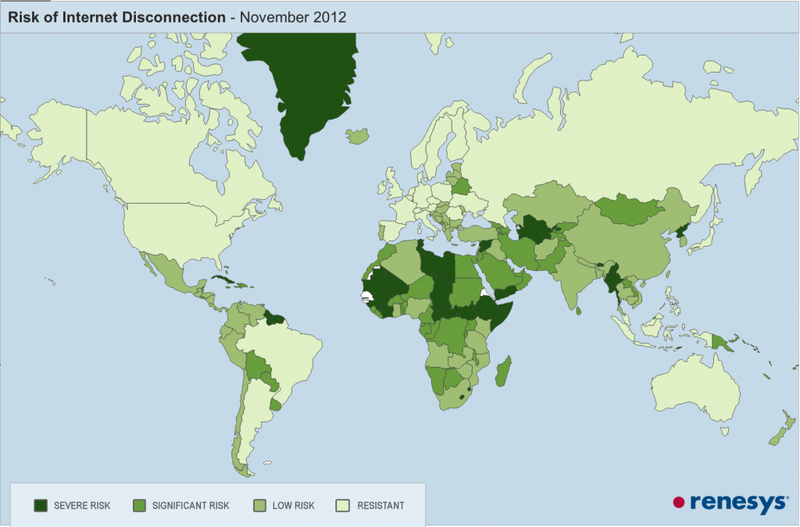 Sixty-one countries and territories including Syria, Tunisia, Algeria, Libya, Myanmar, and Yemen are in the “severe risk” category for Internet shutdown. Egypt falls into the “significant risk” category because they have fewer than 10 service providers at their international frontier. “Disconnection wouldn't be trivial, but it wouldn't be all that difficult,” as was demonstrated by the Mubarak government when it took several days to disconnect. This map shows the global Internet diversity with four categories. Where does your country fall?